Have you ever heard about the Sabbazza sauce? I invented it! And now I will tell you how. Parsley used to be one of the few forbidden ingredients in my kitchen! Why am I writing at the past tense? Well, we don’t know why, but apparently he has no problems with the parsley I can find at the local market place. 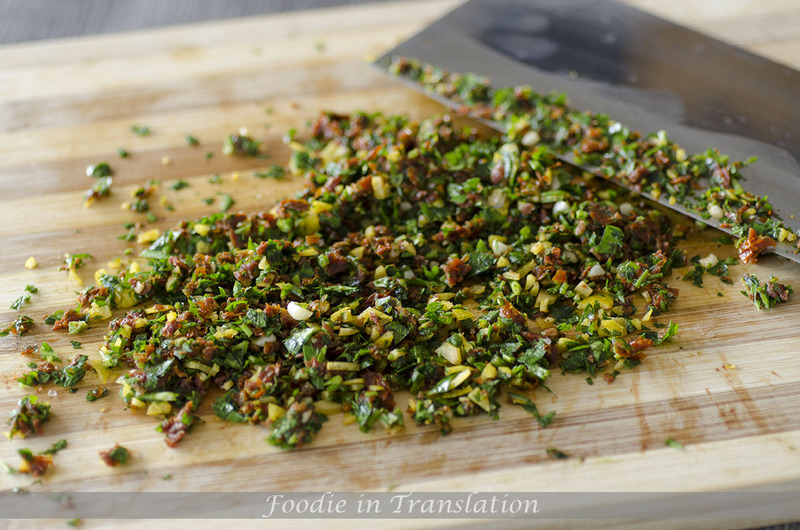 And it is such good news, because my latest craze is chopping not only aromatic herbs but almost every ingredient at my disposal, and if I were not allowed to use parsley, it would be unfair. 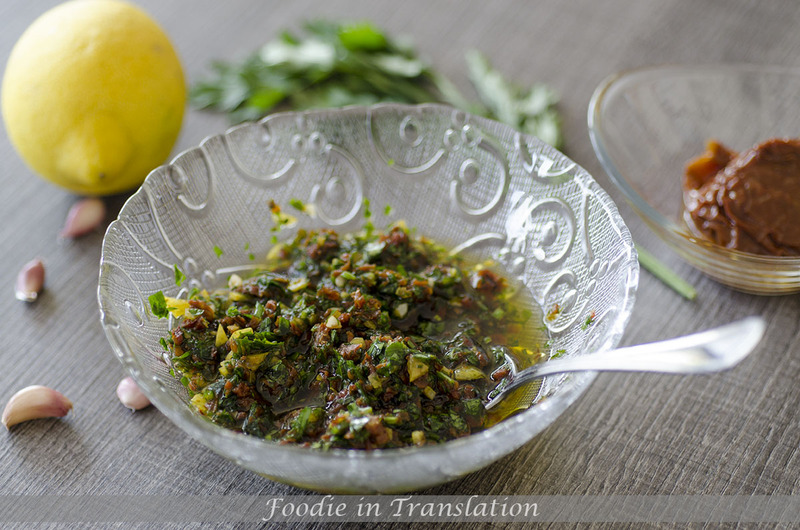 Well, today I will show you a sauce for which I got inspiration from the chimichurri, an Argentinian sauce we discovered one year ago or so in an Argentinian restaurant, served with delicious grilled meat. Being a sauce completely invented by myself, it had no name. So we had to find one! The name comes from an Italian play on words gone south during dinner. Apart from jokes, it is perfect with red meat, most of all pork, with white meat, guineafowl, and it gives a new flavour even to vegetables, such as potatoes. You can even eat it raw, if you like it. 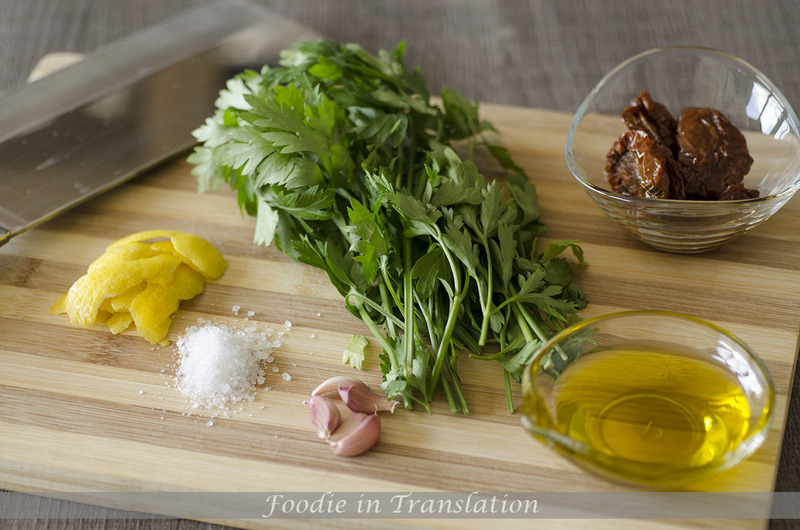 Place parsley, dried tomatoes, lemon zest, the peeled garlic and the salt on a wood cutting board and chop them. I used a Chinese cleaver knife, but you can use also a mezzaluna knife. I suggest you not to use an electric blender, because we don’t want a sauce with a creamy texture. Put the chopped ingredients in a bowl, drizzle with a lot of olive oil, season with salt, mix and the Sabbazza sauce is ready.